By using copper instead of aluminum as the conductor material for the squirrel cage, rotor losses in IE3 systems are considerably reduced. The specific conductivity of copper is about 60 per cent greater than that of aluminium. The slip under load, which is proportional to the rotor losses, is significantly decreased compared with aluminum motors. The torque curve in the operating region is considerably steeper. The breakdown torque is attained with a lower slip. In addition, the starting torque, which is proportional to the rotor losses, is significantly lower. Unlike aluminum motors, IE3 motors with a copper rotor do not require an increased amount of iron or need merely a moderate increase. However, as well as the choice of alternative materials such as copper, other measures can also be taken. These include the use of sheet lamination material with lower specific core losses, larger conductor cross-sections in the windings, flux-optimized windings, and smaller winding heads. 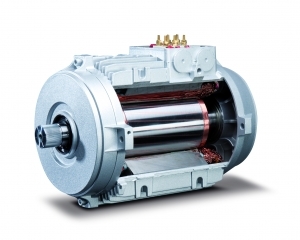 Further increases in efficiency can also be achieved with permanent magnet motors and with frequency inverter operation (synchronous motor principle).